Mushroom Magic is a completely revised version of its predesessor, long since out of print, which, for the first time in South Africa, focussed a whole cookery book on the mushroom as a culinary delight. That earlier prodcut had at asits title Have Fun with Mushrooms. The new volume runs the full gamut of recipes which uses mushrooms; from starters or hors d’eouvres through soups, fish dishes, snacks and light meals to main meat and vegetable dishes and even, surprisingly, desserts. The nutritional value of mushrooms is explained and their preparations in the kitchen is invaluable for the cook. Mushrooms Magic is, however, more than a mere cookery book and compendium of recipes. The author, Eric Bolsmann, who is well-known for his his many thoroughly researched books and his articles on culinary and related matters, has again delved deeply into the archives. As a result the whole history of msuhrooms and their cultivation is related in a fascinating manner, the folklore attached to this fungus takes one back to the dim Indo-European past and to beliefs in?China and among the American Indians. 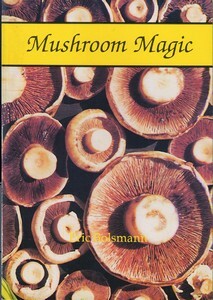 It is most suitable for pleasant bedside reading and, if this should lead to the recipes being applied in the kitchen, so much the better. .
Mushroom Magic was published by Be My Guest Publishers in Pretoria as a 124-page soft-cover edition with colour photographs in 1992.